One of the seven Emirates, Dubai is known for its marvelous architecture and is an epitome of modernization and innovation. One may even say that it is an eighth wonder of the world in itself. The rate of progression is beyond calculations. Earlier sand was the undisputed ruler of this wonder city; nowadays it has been dethroned by the luxurious skyscrapers and the exclusive cozy villas. The credit goes to Dubai’s ruler Sheikh Mohammed, who had a belief in his subjects and a vision in his eyes to turn his ‘mulk’ into a hub of international trading and tourism. The Burj Khalifa boasts of being the tallest structure not only of Dubai but of the whole world. If you want to get at its top, it is advisable to book it online ahead of your visit. Two of the biggest malls in Dubai, the Dubai and Emirates mall, serve a platter for you with its luxury brand stores, cafes, and restaurants. The man made aquarium of Dubai mall and the Ski Dubai in Emirates mall is an eye catcher for all adventure lovers. Starting from January till February, Dubai Shopping Festival is the biggest shopping event in the Middle East since 1996. Every year, DSF lives up to its promise of staging the most exciting activities for the whole family, inspired by the theme One World, One Family, One Festival. We provide Dubai Tour packages to our clients at competitive prices. We will surely turn your journey into cherished memories. Before you leave for Dubai, it is essential to know a bit about this amazing city. Dubai is divided into several districts. It is a fact that Dubai’s economy runs on trade and tourism, not on oil. Arabic is the official language but English and Urdu are also widely spoken along with Hindi, Persian, and Malayalam. Islam is the official religion of all of the emirates. UAE Dirham is the currency of Dubai. When to go: The best time to visit Dubai is between November and April, when the weather is coolest. If you are visiting during Ramadan days, be vigilant, it is illegal, not to mention rude, to eat, drink or smoke in public. However the best part is, hotel rates drop up to 70%. Climate: Dubai has a sub-tropical, arid climate, with perfect weather for at least six months out of the year. The weather is pleasant and dry during winters. Temperature ranges from about 10 to 20 degrees on winter nights, to 40 to 45 Degrees in the midday summer heat. Rainfall mainly happens in winter and is infrequent. Getting around: Buses run between Dubai International Airport and Deira bus station every half hour. Taxis run all over Dubai, so if you want to travel from one end to the other hiring a taxi would be the best. Metros can serve as a good option too. Return transfers from Dubai International Airport in a private vehicle. Dhow Cruise Marina with Dinner including return transfer on seat in coach basis. Desert Safari with BBQ Dinner on seat in 04 WD basis. Tourism Dirham fee not included. This should be paid by guest directly at the hotel. GST 5% tax will be charged extra on total billing. Expenses caused by factors beyond our control like rail and flight delays, roadblocks, vehicle mal- functions, political disturbances etc. On your arrival in Dubai, you will be escorted to your hotel by our representative. Check-in at the hotel, relax and you have the rest of the day at leisure. In the evening, we will pick you up for Marina Dhow Cruise. This premium cruise tour is for travelers seeking a truly refined and casually elegant cruise experience. For an out of the box dining experience, head out for a two-hour Dhow cruise (Traditional Arabian Boat) along the classy Dubai Marina that is modeled to resemble a Venetian style canal. Cruising through the waters in a leisurely style, you can see the mesmerizing skyscrapers of the latest and amazing Dubai Marina residences. Dubai Marina Dhow Cruise Dinner is a special two-hour dinner that evolves abundant fun and thrill. Adding to the dining experience are mind-blowing performances onboard our dhow bounded by dazzling illumination and their multihued manifestation on Dubai Marina’s water. If someone is looking to have a breath taking experience then with Dubai Marina Dhow Cruise Dinner is a must. After a filling breakfast proceed for a half day tour of the city. The tour takes you to the Bur Dubai Creek, Spice market. You can stop for a photo-Stop with the Burj Al-Arab, the world’s only 7 star hotel. 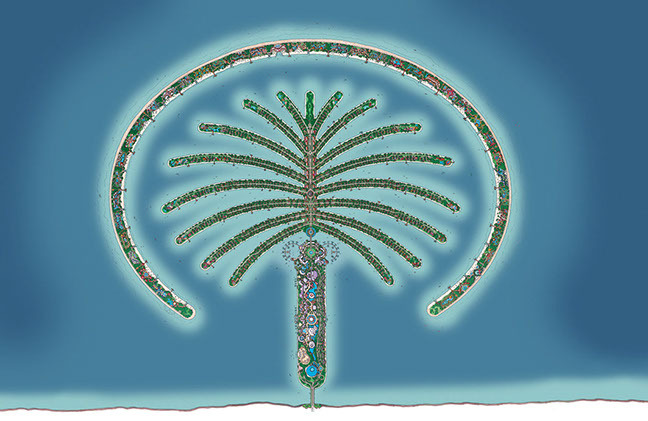 From there you head off to the man made Palm Island and its crowning glory, the Atlantis the Palm Hotel. The high point of the tour is definitely the spotlessly white Jumeirah Mosque. Please note that you should not wear shorts, back and arms should be covered and women need to cover their heads with a headscarf. In this tour you will also visit old Arabian houses with their traditional architecture. At the end of the tour return to the hotel. In the evening, we suggest that you take this opportunity to take tour of Shopping visit to Dubai Mall and Burj Khalifa. Dubai mall, also known as the home of Dubai Shopping festival is the largest in the world. Shopaholic or not, this mall is definitely for you. Burj Khalifa, the world’s tallest building pierces the sky at 828 m (seven times the height of Big Ben) and opened on 4 January 2010, only six years after excavations began. The main attraction is the Observation Deck ‘At the Top’ on the 124th floor. From such lofty heights you can easily pinpoint The World, the three Palm. After Breakfast, day is at leisure. In the afternoon, you will be taken for Desert Safari. Your tour begins with an unforgettable roller coaster drive in the desert skimming over the magnificent Sand Dunes. Amidst all the fun and action stop for pictures while the tour heads towards Ali’s camel farm for a short visit. A traditional welcome awaits the guests with Arabic coffee, tea and dates while the charcoal fires and the traditional oven is lit in preparation for the evening dinner. Take some time out to relax in the Arabic tents furnished with carpets and pillows for your comfort or chill out by the campfire. Get a henna tattoo,experience an unforgettable camel ride, view the Tannoura dance show and an exotic belly performance under the campfire-so much and more. The evening ends with a delicious three course barbeque meal with a variety of meats and salads served beneath the starlit skies, accompanied by authentic Arabic music. After dinner drive back to the back to the city. Today, after breakfast, you have the rest of the day at leisure. We recommend you to take a Exclusive Seaplane tour(operates every Friday). Soak in breathtaking panoramic views of Dubai’s iconic landmarks with the Dubai Seaplane Snapshot . Enjoy thrilling water takeoff and landing on the waters of the Arabian Gulf in a 9 seater Cessna Caravan. This 20 minute seaplane flight is a must to make the most of your time in the UAE! Witness present day wonders including the Palm Jumeirah, Burj Khalifa, World Islands, Burj Al Arab as well as the historic Dubai Creek, the bustling Port Rashid and more. It’s a view that will be remembered for a lifetime. Post breakfast, the day is at leisure for you. We recommend you to take the Aqua venture and Lost Chambers tour. This fantastical labyrinth of underwater halls, passageways and fish tanks recreates the legend of the lost city of Atlantis. Some 65,000 exotic marine creatures inhabit 20 aquariums, where rays flutter and jelly fish dance, moray eels lurk, and pretty but poisonous lion fish float. The centerpiece is the 11 million-liter Ambassador Lagoon. As the wonderful evening comes to an end, you are transported back to your hotel for the night. Prices In INR. Tentative Cost Only. Subject To Change. Xtra Mile Travel Services will apply for it’s customer’s Visa to UAE, if the entire package is booked through us. Scanned copy of passport front and back.